Unlike humans, hamsters' teeth never stop growing, and without objects to gnaw on, can grow too long and puncture into the cheek or jaw. Claws grow in a similar fashion and require regular care to avoid overgrowth. You can provide items that help your hamster file down both his claws and teeth; however, he may need you to step in and help. Regular monitoring of both teeth and claws is essential. You can help your hamster keep his nails and teeth trimmed with a couple additions to his hamster habitat. For his teeth, he needs items to gnaw on, such as hamster treats, larger dog treats, non-treated and chemical-free woodblocks or pine cones. For the claws, a rough surface, such as sandpaper, provides a natural file. If your hamster habitat has tubes, consider rolling a piece of medium grit sandpaper and placing it in the tube. 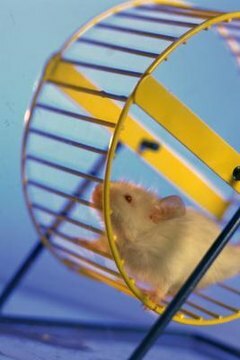 Another option is to glue sandpaper into the hamster wheel. In order to avoid possible complications from overgrowth, it is essential to check your hamster’s teeth and claws on a weekly basis. If you notice that, despite your efforts, his claws or teeth appear too long, talk with your veterinarian. He can trim both the teeth and the claws. You can also do the trimming at home. Ask your veterinarian to show you the correct way to avoid injuring your pet. Hamsterific.com: What Do I Do if My Hamster’s Toe Nails Are Too Long? What Happens if a Hamster's Nails Get Too Long?